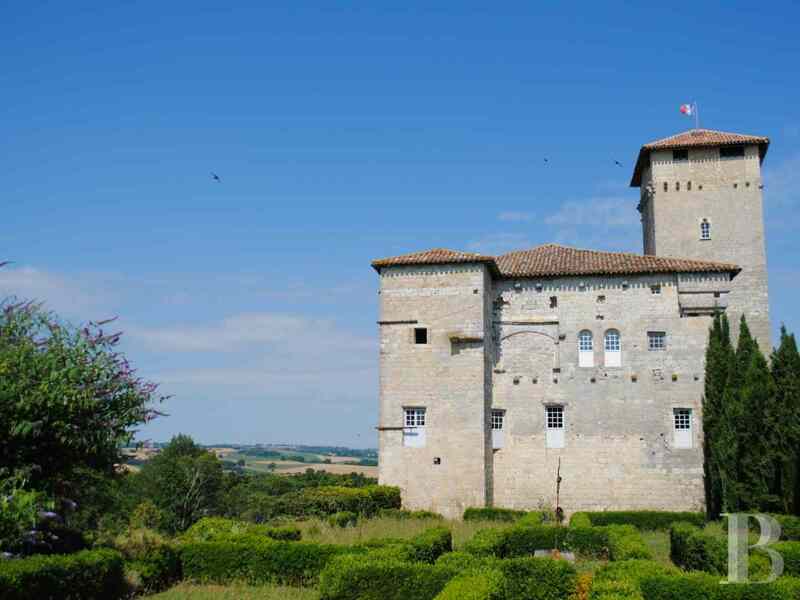 A small village, barely an hour from Toulouse and but 10 minutes from Lectoure (with its market as well as all shops and amenities), is to be found at the foot of an old fortified town, the heights of which ever featuring a castle whose original function was defensive. Local peace seemingly now attained, the tranquillity of the premises has naturally modified the building’s original military vocation. 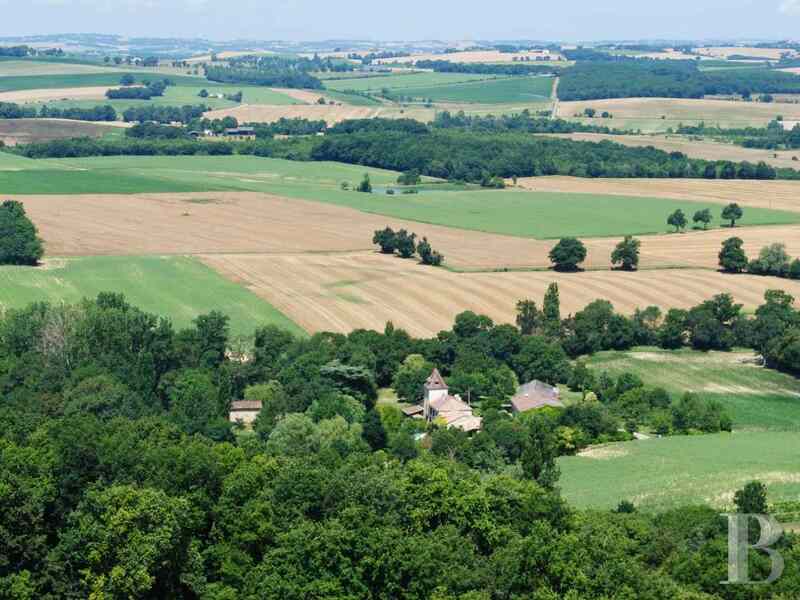 The panoramic view on offer from near the castle is captivating courtesy of the pleasant feeling resulting from the sight of valleys, streams and a kaleidoscope of fields and copses stretching for as far as the eye can see. 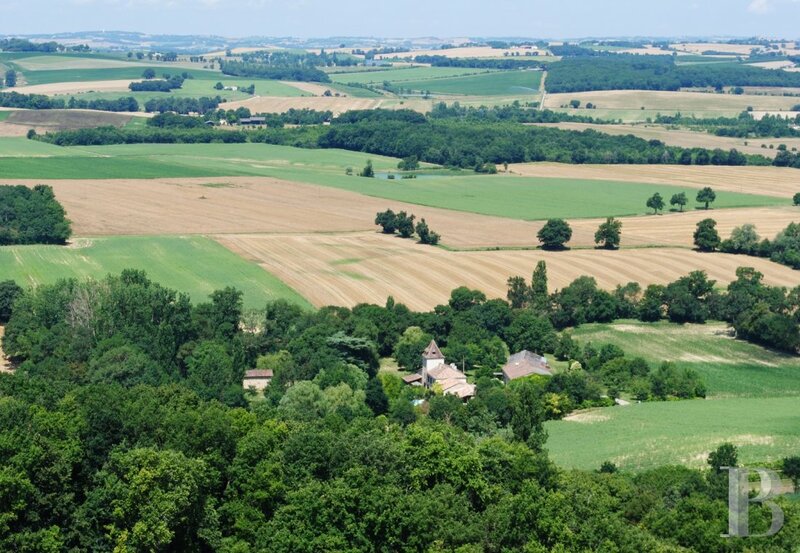 The village is reached via narrow, minor roads, turnings off other, scarcely bigger roads, giving the impression of being isolated and yet everything is within easy reach. 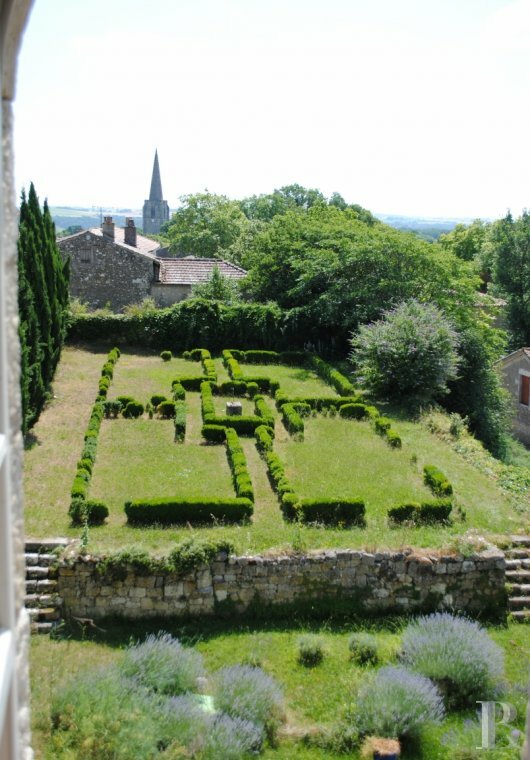 Near the castle, the eye is initially drawn not only by a good quality construction, made of slightly uneven white stone, but also by a row of cypress trees bordering a little French garden, along a narrow street, with healthy boxwood waiting to see what the future might bring. 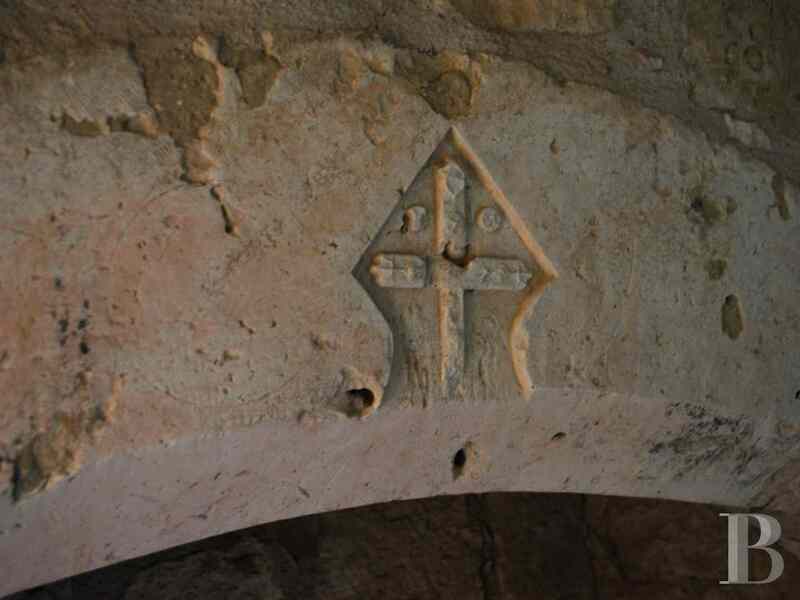 The finishing touches that sometimes approach ostentation, like those to be found on the buildings in the Touraine and Anjou regions, are absent here. 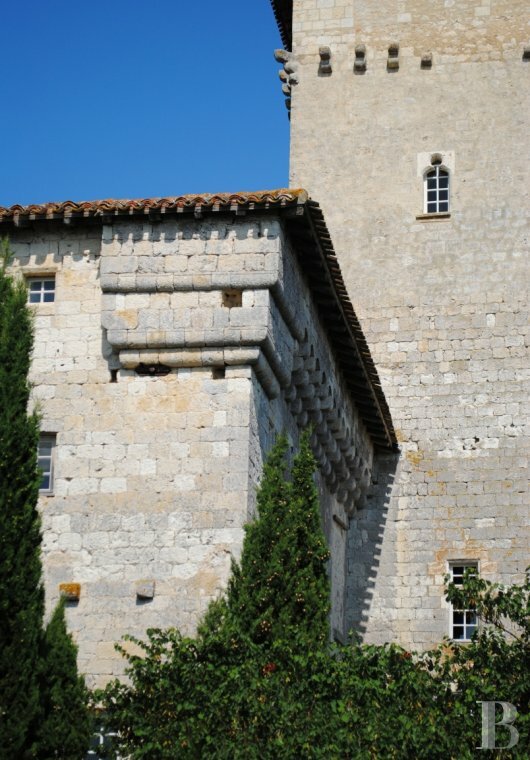 Instead, these buildings reflect a much simpler quality, particular to Gascony, which is based on the intelligent use of well-proven techniques used for a clearly defined function. Soberness, effectiveness and solidity do not, however, exclude an attention to appearance, the latter slowly revealing itself over the years with in-depth familiarity. 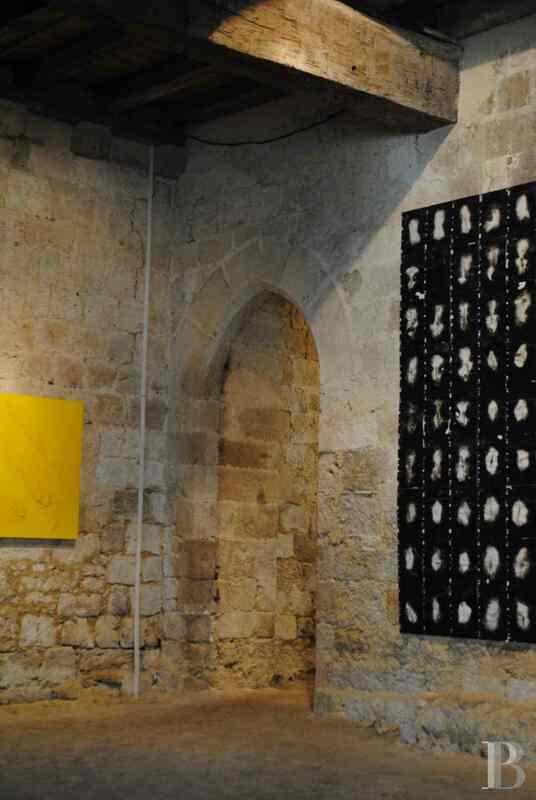 Resulting in the idea that each object reaching such a level of simplicity can but satisfy the spirit and the senses. 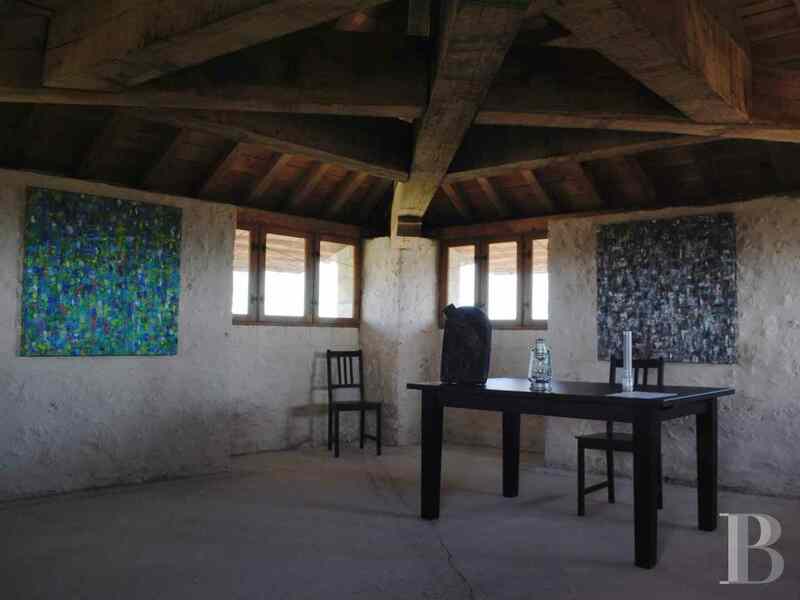 The building’s robust appearance, with seemingly small, and yet cleverly positioned openings, sized to limit the seasonal effects of the sun’s rays, could easily mislead visitors into thinking it austere, it is not. 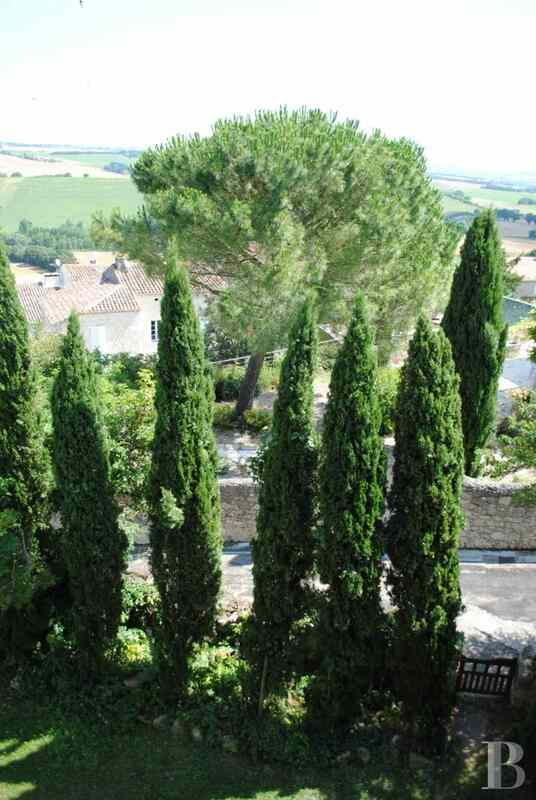 A village-size garden, planted with decoratively trimmed boxwood and cypress trees, harmoniously enhances the premises and gives the castle a stately, but private air. 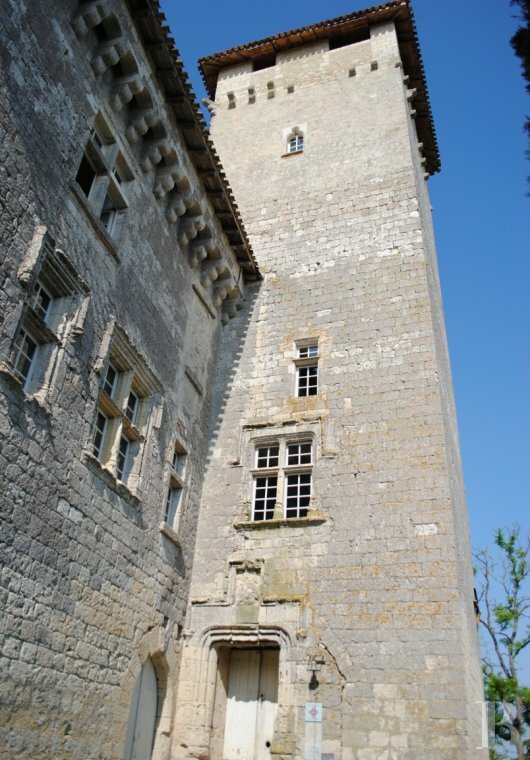 Dating from the first half of the 14th century, this castle bears last witness to the standard Gascony castle that existed in a region much attached to the art of “Trovar”, a magnificent expression of poetic art in the Occitan language, propagated throughout the world by the famous troubadours. 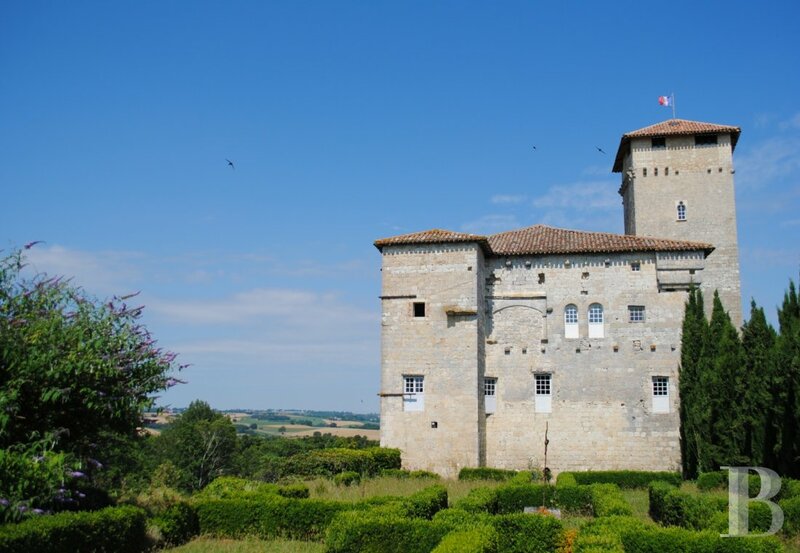 A Gascony castle was initially a plain tower or keep, known as “sala”. 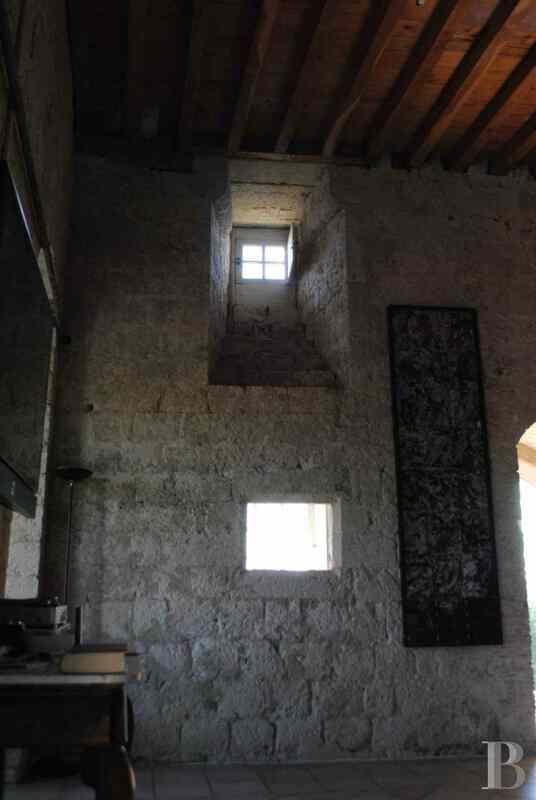 3 or 4 stories high, it was used as living space as well as for defensive purposes. The first level, generally intended for storing food and as a wine storehouse, had a packed mud floor, as is still the case here. The rock on which it was constructed provided a mechanical stability and prevented rising damp. The building had, above all, to be sound. 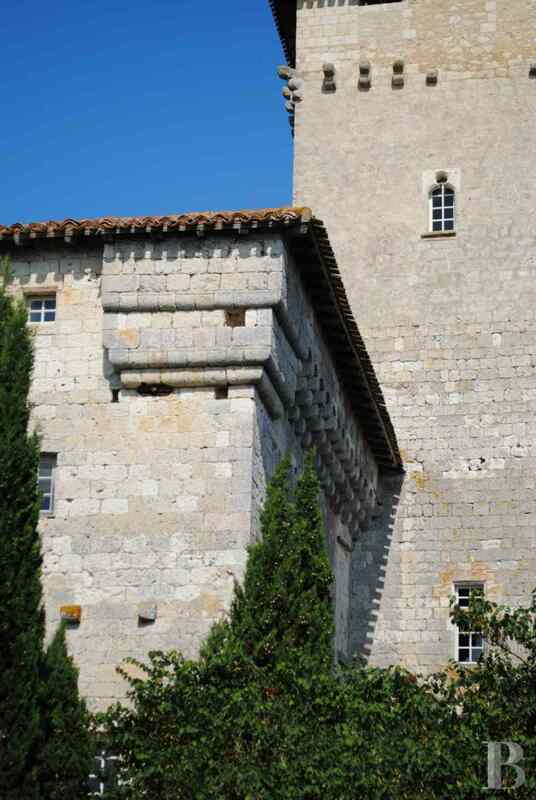 The long facades face south-west and north-east, which is fairly traditional, the biggest openings very often being on the north-east and south-east sides. 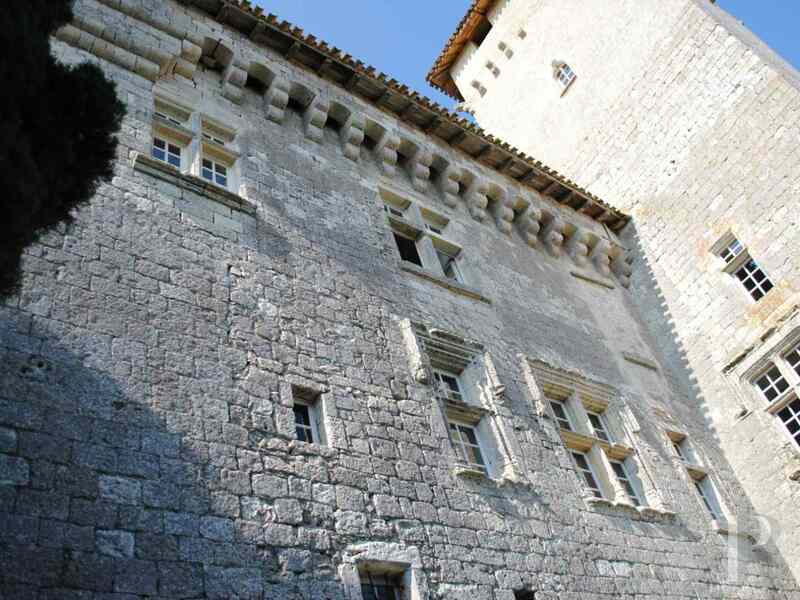 In this instance, the building layout meets two axes of symmetry, just like that of Avézan castle. One is based on the median longitudinal axis represented by a load-bearing wall; the other, on a diagonal axis, by the presence of a tower at each end, one of these two towers acting as a keep. The roofs are always hipped and covered with Roman tiles. 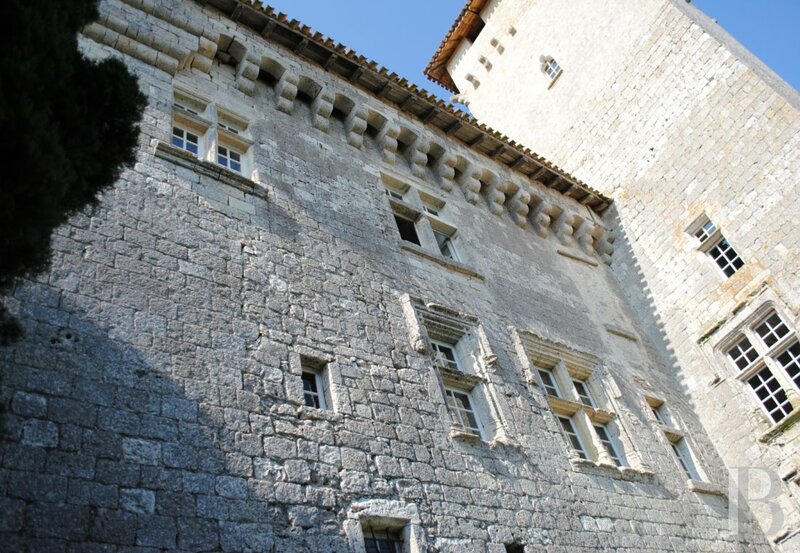 The facing is limestone, sometimes mixed with sandstone features, particularly in wrought sections. Once through semi-circular, double doors, a few steps go down to what was a storage area. 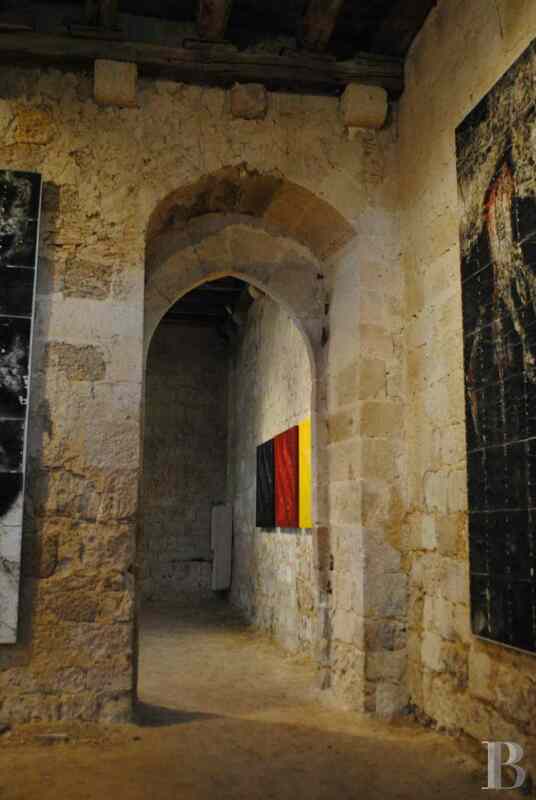 It has a packed mud floor; at the end, an impressive load-bearing wall features an opening at one end, topped with a splayed, shallow gothic archway. The height of the ceiling is amazing (3.83 m), inciting residents to make good use of this space: the current owner has hung canvases. 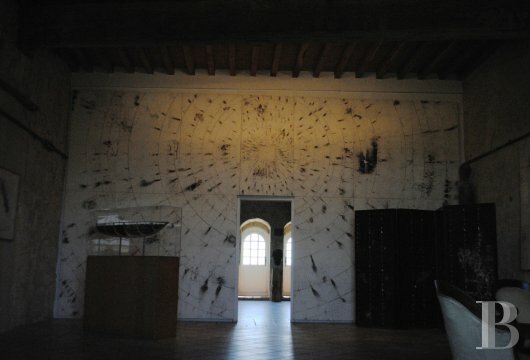 The opening provides access to a second room, almost symmetrical to the first, but of different proportions: the floor surface area is slightly smaller and the ceiling higher (4.26 m). 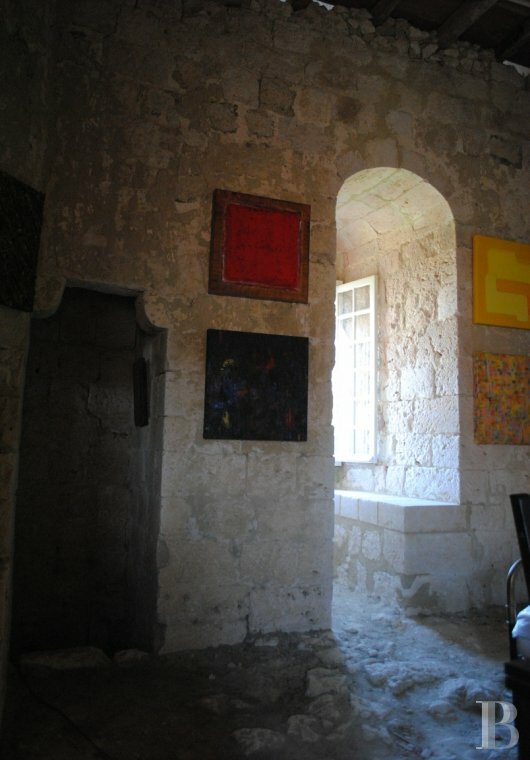 Rusticity disappears here, with a first room corresponding to the entrance room on the first level. Impressive polychrome beams, with floral and animal motifs, run lengthwise. A wide, stone fireplace bears witness to the way of life that took place here. 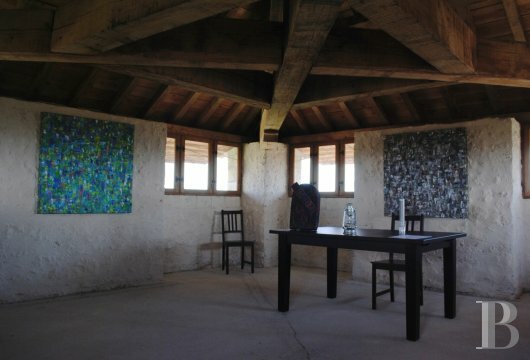 Natural light comes in via openings in the north-east and north-west sides, creating a very pleasant atmosphere. 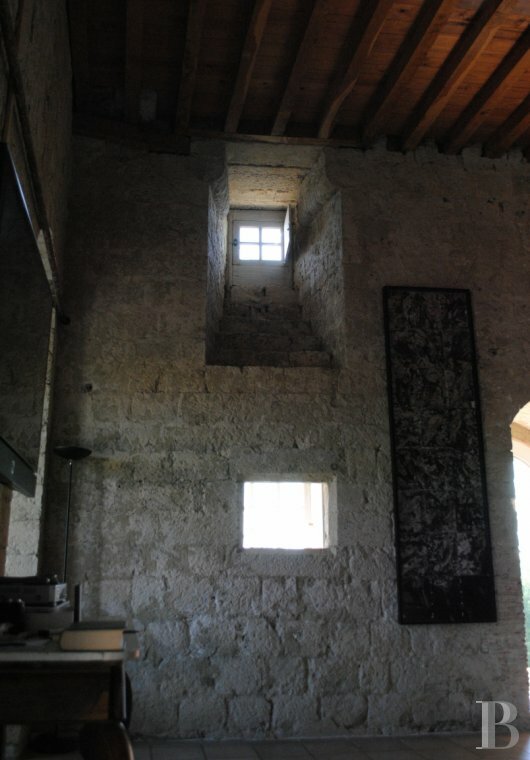 The ceiling beams are 2.80 m high, whilst the difference between the two floors, above and below, is 3.64 m.
As on the first level, an opening made in the load-bearing wall provides access to the south-west section. 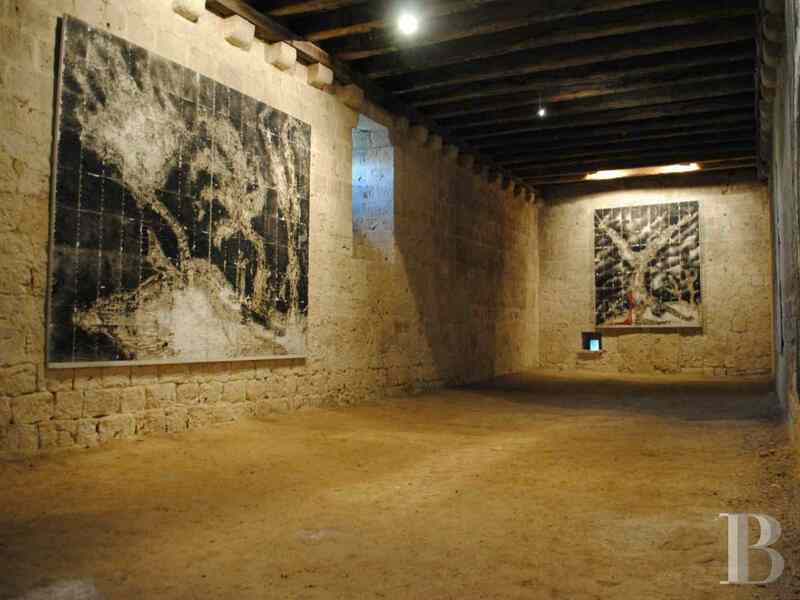 The latter is divided into a 24.5 m² kitchen, a 28.5 m² bedroom, a 32 m² room in use as an artist’s studio, a 6 m² bathroom and the old latrines, spanning approx. 1 m² and suspended in mid-air. On this level, it is the north-east section which is divided. 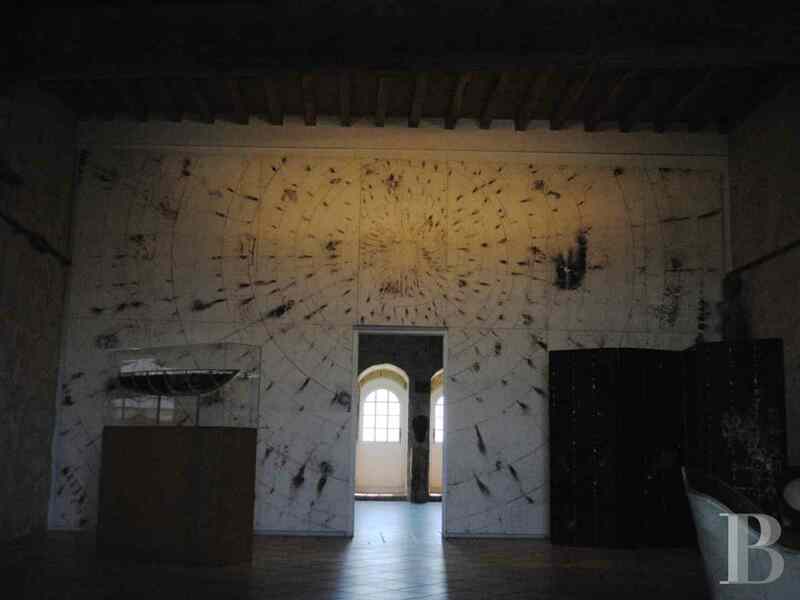 It comprises two communicating exhibition rooms which let in copious amounts of south-east/north-west, through light. Strangely, the ceiling beams are higher and the difference between the two floors, above and below, is greater than those on the second level. In the first room: respectively 3.71 and 4.39 m; in the second room: 3.90 m and 4.6 m.
Two openings at each end of the load-bearing wall provide access to a large room, taking up the south-west side, in use as a library-study. Essential, as a gateway and a defensive feature for the village, then later as an integral part of the castle, the tower has been somewhat levelled off as is proved by corbelling very near to the underneath of the roof. 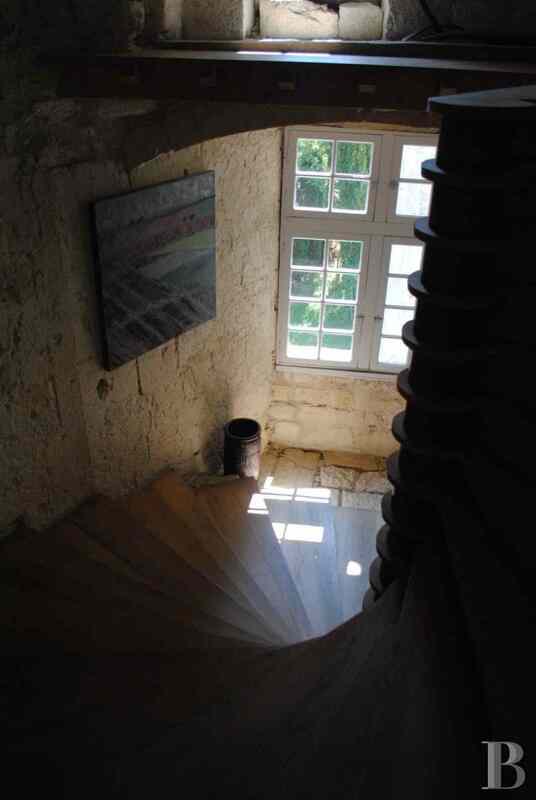 It houses a spiral stairway providing access to three levels, the top one of which, in the attic space (the roofing framework, with horizontal roof framing, reconstituted in accordance with good trade practices), makes an excellent observation point. 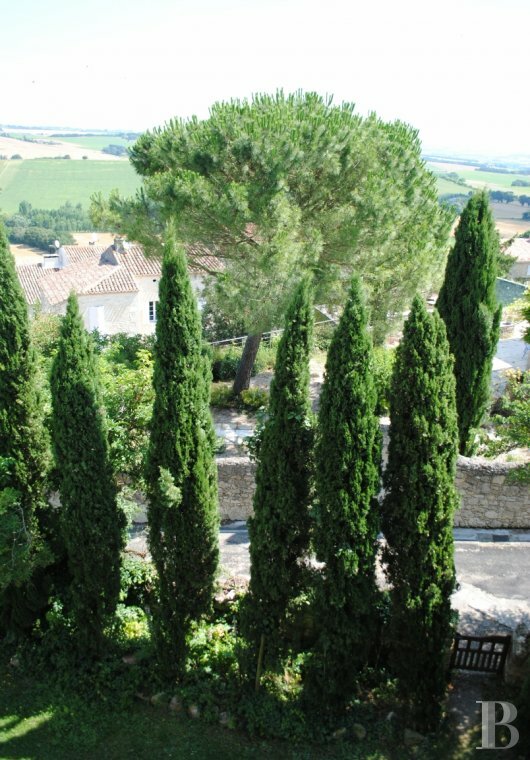 Openings look out over all of the surrounding countryside and the village. 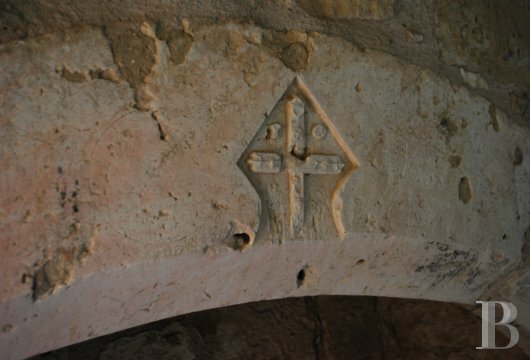 A narrow entrance, directly reached from the spiral tower, opens into a bedroom, with a fireplace marked with a so-called cross of Occitania. A seat has been set in the thickness of the wall, below a window letting in a very pleasant light. 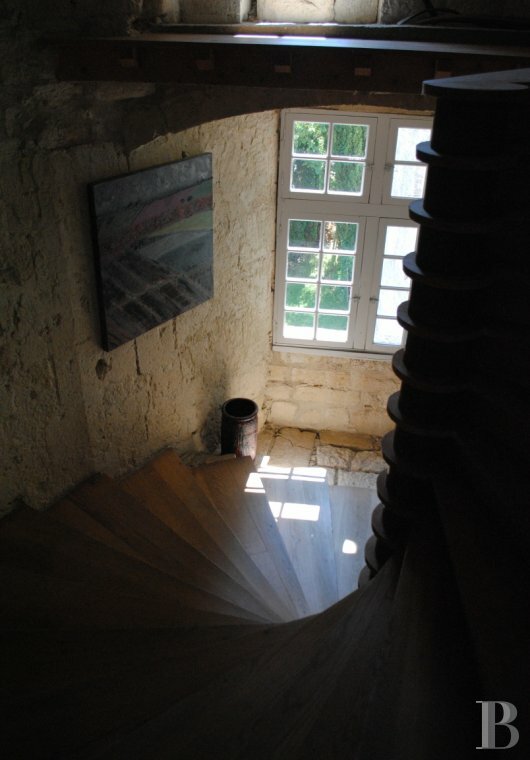 This section exudes the very essence of a traditional Gascony castle. Contrary to the room on the first level, the room on the second level has a 4.98 m high, vaulted, masonry ceiling. 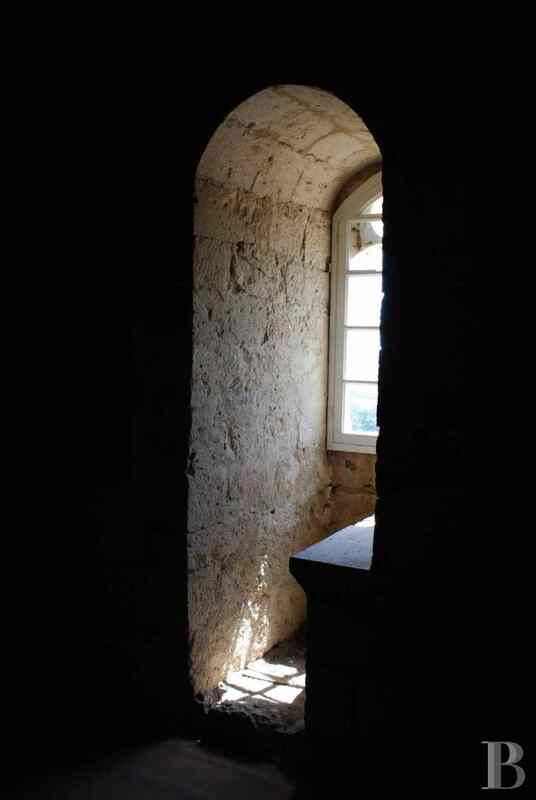 Here too, a seat has been set in the flanning made in the thickness of the wall, below a window letting in light. Dominated by an impressive roofing framework, with horizontal roof framing, supporting the hip roof, a room with windows facing all four directions of the compass is but an invitation to stay and observe. As the windows are all fitted with glazed frames, it would also be possible to live here. The impressive size of this listed castle unpretentiously blends in with the pleasant surrounding countryside. Balance is one of the qualities of this Gascony which saw the birth of D'Artagnan and so many other “cadets”. This building is now comfortable courtesy of sober restoration works, in harmony with the sharpness of its architectural lines. 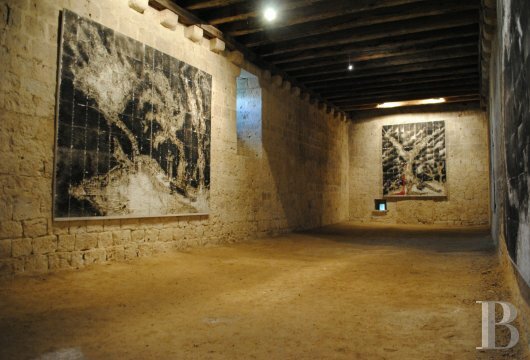 Furthermore, it enhances the works of art that find suitable settings in the bare interior spaces and appears to inspire new ones. A photography festival is held nearby in Lectoure. It is just as if the region has decided that creation is part of the pleasant way of life, with which it has long been so rightly credited.